Atenolol is a beta blocker: a drug that lowers blood pressure, makes the heart beat slower, and reduces the oxygen demand of the heart. Atenolol can be prescribed with high blood pressure, heart disease (angina pectoris, cardiac arrhythmias, myocardial infarction), migraine, too rapid functioning thyroid, anxiety and nervousness, and essential tremor. Take Atenolol at fixed times. The tablet can be swallowed as a whole with some liquid. Note: You can not just stop using Atenolol. This medication should always be reduced gradually to prevent health problems. 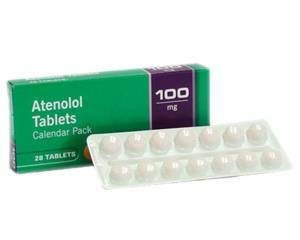 Atenolol tablets are available in 25, 50 and 100 mg. Ask the doctor which strength you should use. The usual dosage depends which condition you have. Follow the advice of the doctor. A missed dose up can be taken at a later time. Follow the procedure as described in the leaflet. An overdose often causes very low blood pressure and heart rate, causing weakness, fatigue and asthma attacks. In this case, warn a doctor. You can find a complete list of side effects in the leaflet. Talk to the doctor if you experience severe side effects, or if you notice any side effects that are not listed in this leaflet. You may not use Atenolol if you are hypersensitive to the active substance atenolol or any of the excipients used. Consult with the doctor about the use of Atenolol if you suffer from asthma or COPD, an autoimmune disease or other serious condition. You may not use Atenolol if you are breastfeeding. Also, the use of this medicine is not recommended if you are pregnant or want to become pregnant, unless the doctor advises otherwise. If you use Atenolol you may feel dizzy the first couple of days.This often disappears after a while and you are able to participate in traffic without any problems. The combination of Atenolol with alcohol may cause dizziness.Moderate your alcohol consumption to prevent this.